Detailing the physical features, habits, territorial reach and other identifying qualities of the Red Velvet Ant. Unfortunately, a classic combination of red and black warning colors may not be enough to keep someone from petting the fuzzy Red Velvet Ant. Though it looks like a furry little ant, the Red Velvet Ant is actually a hairy, female wasp! Touching one is tempting fate. Males can fly, but females are wingless, and it is the female that can sting. She runs around the ground like ants do, confusing prey and predator alike. Velvet ants typically call arid regions of the Southwest U.S. and Mexico their home. All adults drink nectar from desert flowers and drink water where they can find it. Females lay their fertilized eggs in another wasp's or insect's nest. When the Red Velvet Ant larvae hatch, which is sooner than the other eggs, they begin to eat the other insect's eggs and any hatched larvae before they have a chance to escape. 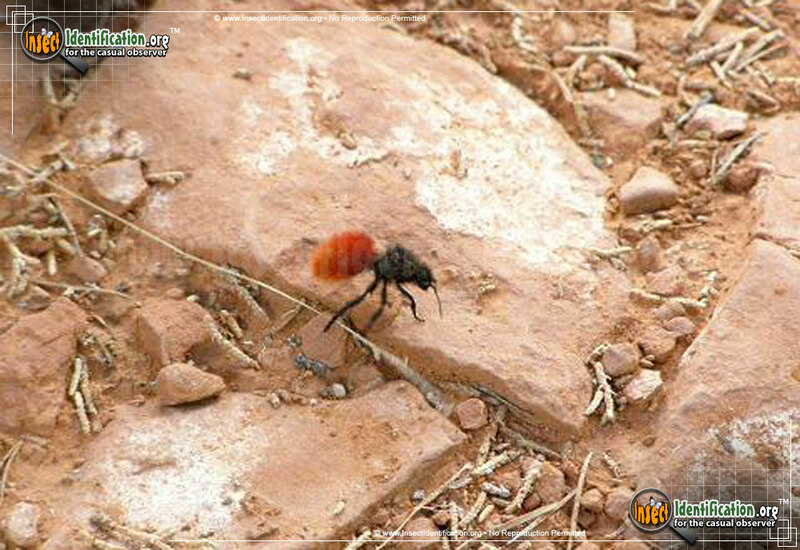 After pupating, the adult form of the Red Velvet Ant emerges.